Silva, 30, is a sixth-generation circus performer and always knew he was going to stay within the family business. He began performing at 6, as many children in circus families do, as a tumbler and eventually learned to maneuver on any number of the highflying acts that would wow audiences: the trampoline, straps, Russian bar, and flying trapeze with his sister, brother and father. But it wasn’t until he saw another Cirque du Soleil aerialist in La Nouba on the silks, or Tissu, that he knew this was the discipline he was going to pursue. Trained on the straps and trapeze, Silva applied those techniques to Tissu. 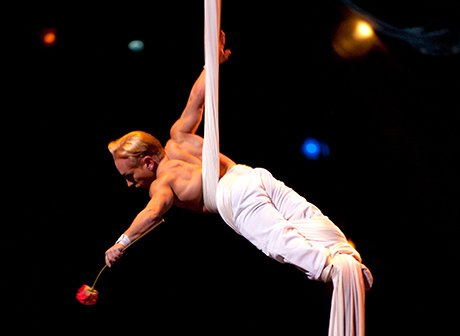 At the time, “there wasn’t anyone doing silks in [his native] Brazil, so I was the first Tissu act.” His performance life with silks began in 1998 and he has been flying high with Zumanity ever since it opened in 2003, even meeting his wife Bethany, who works in wardrobe, while in the show.